“Golden Growth.” That’s what USA Swimming has said of the recent surge across the sport. Athletes like Michael Phelps, Nathan Adrian, Ryan Lochte, Simone Manuel and Katie Ledecky have paved the way for massive growth across the sport – USA Swimming claims more than 300,000 compete in nearly 2,800 teams stretching across the U.S. While all parents agree swimming is important, selecting the right swim school can be confusing. To make sure your kids are developing crucial water safety and swimming skills, consider these seven important swim school questions. 1. How young can kids start swim lessons? Starting young is best. 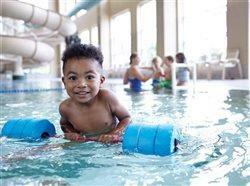 Swim lessons start for kids 4-months-old at Life Time Fitness. The organization promotes getting kids in the water before their first birthday because they remember the water environment from the womb, which lays a great foundation for learning to swim and love the water. However, avoid swimming with infants before 3 months due to their underdeveloped immune system. 2. How frequently should kids take lessons? The most effective way for children to learn to swim is to do lessons on a continual basis. This is typically once or twice a week. This consistency helps children regularly build on their skills without pause when learning loss can occur. While summer serves as a reminder of the importance of swim lessons, signing up for lessons year-round ensures your kids don’t regress over winter. 3. What is a good swimmer-to-instructor ratio? It’s important that there are not too many swimmers per teacher in each class. A ratio of 3:1 is good for intro-level swimmers and a ratio of 4-6:1 is good for intermediate or higher levels. There never should be more than 6:1 no matter what the age. 4. How long should the class be? For beginners, 30 minute classes are appropriate. This is enough time to focus on skills but not too much so they get tired or lose interest. For more experienced swimmers, classes can be up to 45 minutes. 5. How do you evaluate a good program? A good guideline is that kids should be active 90 percent of the time during class. Great programs use in-water platforms to shorten the distance of a full-length pool. Quality instructors will be energetic and excite kids. Communication should be a top priority. For example, Life Time Fitness instructors communicate each child’s progress at the end of each month. We let the parent and child know which skills they have mastered and move them on to the next level when they are ready, instead of waiting for the end of a session. 6. How long will it take my kid to learn how to swim? Every child varies, however, you should see progress every month (or approximately every 2 hours of lessons). Keep in mind, if you are not consistent with classes, you can’t expect improvement. 7. What should the pool temperature be? A pool that is too cold can be distracting and impede a child’s ability to swim. Water temperature should be at least 86 degrees with a similar air temperature. Additionally, facilities should be clean and there should not be a strong chlorine smell in the air.